June 17, 2016 – When NASA’s Juno spacecraft arrives at Jupiter next month, it will be forging into a treacherous environment with more radiation than any other place NASA has ever sent a spacecraft, except the sun. During the Juno mission, the spacecraft will probe beneath the obscuring cloud cover of Jupiter and study its auroras to learn more about the planet’s origins, structure, atmosphere and magnetosphere. But, under the cloud tops is a layer of hydrogen under such incredible pressure it acts as an electrical conductor. Scientists believe that the combination of this metallic hydrogen along with Jupiter’s fast rotation — one day on Jupiter is only 10 hours long — generates a powerful magnetic field that surrounds the planet with electrons, protons and ions traveling at nearly the speed of light. The endgame for any spacecraft that enters this doughnut-shaped field of high-energy particles is an encounter with the harshest radiation environment in the solar system. Over the course of a one year mission, Juno will be exposed to the equivalent radiation of 100 million dental X-rays. At Lockheed Martin Space Systems in Littleton, Colorado, where the spacecraft was built, engineers were challenged to design a spacecraft that could withstand this extreme environment. With guidance from JPL and the principal investigator, Lockheed Martin built a special radiation vault made of titanium that would act as a centralized electronics hub. “Without its protective shield, or radiation vault, Juno’s brain would get fried on the very first pass near Jupiter,” said Bolton. While other materials would also make good radiation blockers, engineers chose titanium because lead is too soft to withstand the vibrations of launch, and some other materials were simply too difficult to work with. Each titanium wall measures nearly a square meter (nearly 9 square feet) in area, about 1 centimeter (a third of an inch) in thickness, and 18 kilograms (40 pounds) in mass. 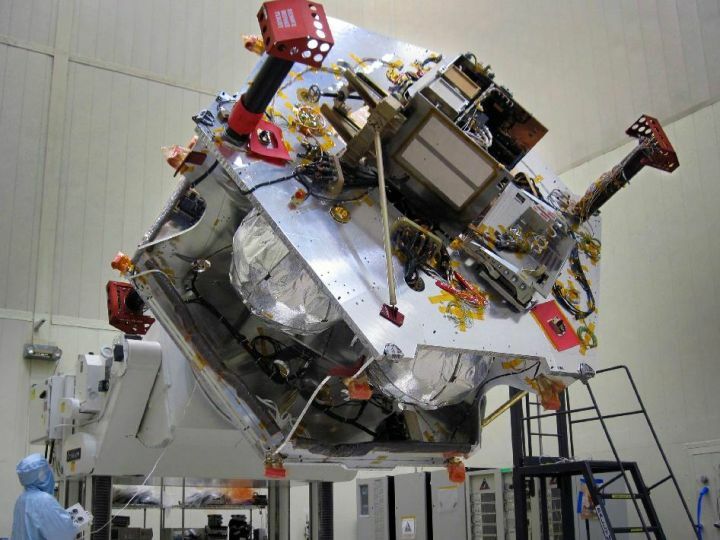 This titanium box — about the size of an SUV’s trunk – encloses Juno’s command and data handling box (the spacecraft’s brain), power and data distribution unit (its heart) and about 20 other electronic assemblies. The entire vault weighs about 200 kilograms (500 pounds). The centralized radiation vault is the first of its kind and although it isn’t designed to completely prevent every Jovian electron, ion or proton from hitting the system, it should reduce radiation by up to 800 times. But Juno isn’t relying solely on the radiation vault. Scientists designed a path that takes Juno around Jupiter’s poles, spending as little time as possible in the sizzling radiation belts around Jupiter’s equator. Engineers also used designs for electronics already approved for the Martian radiation environment, which is harsher than Earth’s, though not as harsh as Jupiter’s. Parts of the electronics were made from tantalum, or tungsten, another radiation-resistant metal. Some assemblies also have their own mini-vaults for protection. JPL tested pieces of the vault in a radiation environment similar to Jupiter’s to make sure the design will be able to handle the stress of space flight and the Jupiter environment. In a special lead-lined testing tub, pieces of the spacecraft were battered with gamma rays from radioactive cobalt pellets and the results were analyzed for Juno’s expedition. JPL manages the Juno mission for the principal investigator, Scott Bolton, of Southwest Research Institute in San Antonio. Juno is part of NASA’s New Frontiers Program, which is managed at NASA’s Marshall Space Flight Center in Huntsville, Alabama, for NASA’s Science Mission Directorate. The California Institute of Technology in Pasadena manages JPL for NASA. Lockheed Martin designed and built the Juno spacecraft for NASA’s Jet Propulsion Laboratory and is also providing spacecraft day-to-day flight operations from its Denver Mission Support Area.